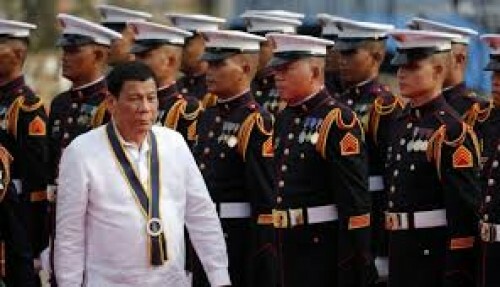 Manila, April 5 (IANS) Philippine President Rodrigo Duterte has threatened to send his troops on a "suicide mission" if Beijing doesn't "lay off" a Manila-occupied island in the South China Sea, the media reported on Friday. Duterte's speech at a rally in the city of Puerto Princesa in Palawan came days after the Philippine government claimed as many as 275 Chinese boats and ships had been spotted in recent months around Manila's Thitu Island in the Spratly Island chain, CNN reported. "Let us be friends, but do not touch Pagasa Island and the rest," Duterte said using the Philippine word Pagasa for Thitu. Duterte said his words were not a warning, but rather "advice to my friends". "I will not plead or beg, but I'm just telling you that lay off the Pagasa because I have soldiers there," he said, according to CNN Philippines. Tensions have risen since the start of 2019 in the South China Sea, one of the world's most disputed regions and an important shipping lane. The Philippines Department of Foreign Affairs in a statement Thursday said their presence was "illegal" and a "clear violation of Philippine sovereignty".